Canali, the Milan-based men’s apparel company, launched their first fragrance this year: Canali for Men. It was created by perfumer Pierre Bourdon, and the notes include bergamot, tangerine, pineapple, apple, nutmeg, cardamom, coriander, lily of the valley, jasmine, violet, orange blossom, leather, suede, iris absolute, guaiac wood, cedar wood, sandal, vetiver, tonka bean, amber and oakmoss. Despite an impressive list of 21 ingredients, many of which had me quite excited, the Canali fragrance is as unimpressive as most everything else these days. It opens with a quick nod to sweet fruit notes and then quickly moves to florals, ending in a mish-mash of woods. The overall effect, however, reminds me of last year’s Vera Wang for Men, though with a slightly richer base of leather and suede. The fragrance is so seamlessly blended that it is difficult to recognize many of the precious notes — where’s my much beloved iris? Where’s the sweet violet? Heck, even the simple glass bottle, with a nod towards classic inkwells, is a yawner. 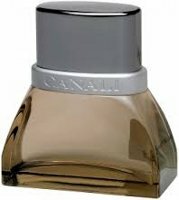 Canali is a nice fragrance, but indistinct and underwhelming. This is a fragrance for the man who is looking to play it safe and smell nice too. Canali is available at major department stores including Saks and Bloomingdales, and at some of the online discounters. Hey R! Thanks for the review! I like the bottle though. Hmm another indistinct perfume is exactly what we need. Hope you are well. Hugs!! OT – tried the mascara – you were spot on! Mwah!! Sorry the mascara didn't work for either of us — oh well! I could kill myself – I was SO proud that I spotted Marcello's review and did not thank Robin for ONCE. Note to Robin – is it at all possible to highlight the names of the authors for readers like me? Thanks in advance! Thanks, Marlen! I should try it nevertheless, because even some fragrances Bourdon made that I did not like, I could appreciate for their beautiful compositions. I am hopeful…. Just like V above I would try it just because it is by Bourdon The Great (that greatness is mostly to do with the fact that he is one of the creators of Feminite du Bois). Thanks, Marlen – I got excited at the sight of the bottle, which I thought rather elegant. But another fruity floral? Oh, dear. N, it would be a good idea to have the author name a bit larger…will see what I can do! Heh, yet another fragrance that causes me to play the word association game. Canali = cannoli, and that in turn causes me to think of that infamous line in The Godfather. “Leave the gun, take the Canali.” Except having read this, I guess you will not be taking the Canali. Still, the notes seem interesting to me, and like others have mentioned, I also hold out hope I will find some appeal in it. I have no doubt that many of you will try Canali, Cannoli, Kanalya (he he he) and think “this is nice” and then stop there. It's no wonder really because Canali isn't known for being edgy, modern, or ultra-chic, but rather, classic, sophisticated and stylish. This scent would be a nice compliment, unobtrusive and conservative, to a Canali scent. Not at all a bad creation, just not one that had a fragrance freak like yours truly all that impressed. Edit: I meant to write a nice addition to a Canali suit. Kevin – I'll be happy to be your partner in crime…just tell me where to sniff! Spot on review… I particularly liked parislondres comment about “another indistinct perfume”. Why is it that for the last ten years nearly every new product smells like something concocted at an American Rennaissance Faire booth? I think we'd have better luck if we left design to the amateur perfume oil buyers. Coming soon: Another cloying vial of vile brew from the kitchentop stoves of Susie Housewife named… TULSA. Lazarus – tell me about it…I had a a friend make me some homemade potions which were 10 times more interesting than half of the new releases I've smelled this year…But stay tuned as I tackle my year-in-review! Hi all. The russian word 'kanalya' must surely have been exported to the swedish language, since our word 'kanalje' means exactly the same thing. So now you know! And M, thank you for this review! I love to read critical reviews. Thanks for the review Marlen. I really trust your views on scents, so without further ado, I won't try this one when it finally arrives in the UK. It had me worried when I saw parislondres thanking you for the mascara. I thought that I had stumbled across some scandal about you..tee hee. Viktor – thanks for the kudos. What's the difference between a suede note and a leather note? I thought suede was inside-out leather. Karamea – well, this is just my idea, I can't speak for the cows….Adjectives usually used to describe suede include buttery and velvety so I'm thinking that the sense of texture evoked is qualitatively different (?) and often has a different effect on a composition from leather which can be sweet, animalic, or sometimes even rubbery (think Lutens Daim Blond vs Cuir Mauresque). Thank you, Marlen. It is so helpful to have a frank review that is not shy about telling us a fragrance is a yawn, even when it's composed by a notable nose.